The following is something I wrote and posted circa January 2000 on what passed for my blog before blogging was what it is today. I'm cutting and pasting and hope that the content is clear without messing with the formatting. On March 24, 1998, Debra L. Fink left home to run some errands. Her parents never saw her again. By midnight Debbie -- 28 -- was dead from a brutal beating to her head and face. Her body had been dumped under evergreen trees next to a used car dealership on Lindbergh Blvd. (Maryland Heights, MO). According to information gathered in newspaper articles and interviews with friends and family, Debbie met James D. McCollum at a bar she often frequented. They played a trivial pursuit type video game for a while, and then went bar hopping. Debbie's parents and local authorities believe McCollum tried to force himself on Debbie. When things didn't go his way, McCollum started beating her. He was picked up on March 29, 1998, charged with first-degree murder and held at St. Louis County Jail without bail. 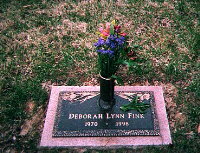 I first met Debbie at a Pundit staff meeting at NMSU. We were both wanna-be journalists trying to make names for ourselves as writers for an alternative newspaper on an otherwise mainstream Missouri college campus. Naturally we became friends. We also joined -- separately -- a co-ed service fraternity patterned after the boy scouts called Alpha Phi Omega. It was in this organization that I got to know Debbie a little better. I had the benefit of being spoon fed the details of Debbie's death. First I heard that a friend had attended Debbie's funeral. Well, that could mean she died of some sickness. But I investigated and got an email paraphrasing the details. So I knew she had been killed. Then I asked a friend at a Springfield newspaper to look into the matter. And I got the knowledge that I can never unknow. Debbie's parents didn't have this luxury. They went from thinking their daughter had gone off on one of her usual rebellious tirade to finding out she had been taken from this earth in a most unnatural manner. It would be so easy to hate McCollum. Create a demon in my mind's eye and label him Jim. But that won't bring Debbie back. In the press release it says that Jim surrendered without incident, which is journalismese for "he really wasn't a bad guy except for this beating a girl to death thing." Jim McCollum didn't wake up that March 24th morning with the intention of beating a person to death. That doesn't exonerate him from his crime, but it should provide some perspective. Debbie wrote me once, asking if she could maybe visit me in Chicago. I wrote back that it probably wasn't a good idea. At the time, life at home had become hell. I think that was the last time I ever heard from her. I always thought I'd run into her at a friend's wedding or some type of NMSU/APO reunion and have a chance to explain and reestablish our friendship. Now, thanks to my own shortcomings, and a guy I never met named Jim McCollum, I never will.